Nebraska remains today much as it has been for the last 150 years—a center of farming and ranching. Most of the state, in fact, is farm and ranching land. Earlier in its history, American Indians hunted and grew crops here. During the mid-1850s, thousands of pioneers traveled through Nebraska’s prairies on their way to California, Oregon, and Utah. According to writer Willa Cather, Mormon pioneers planted sunflowers as they headed west through Nebraska and other states to create a trail for later travelers. The 300-foot tall Chimney Rock, now a national historic site, was a well-known and comforting landmark for westbound pioneers. Rodeos are still a favorite entertainment in Nebraska. Burwell has hosted The Big Rodeo for more than 80 years. 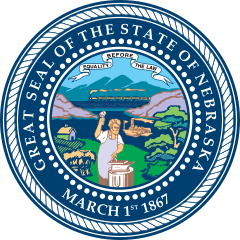 Nebraska is bordered by Kansas, Colorado, Wyoming, South Dakota, Iowa, and Missouri. Summers are warm and dry; winters are cold and windy. Meatpacking is big business in Nebraska. Omaha is a center for insurance and finance. Mammoths were among the first residents of present-day Nebraska. Their remains have been found in every county there. Scientists estimate that 10 mammoths are buried in each square mile of the state. In Alliance, sits Carhenge, a replica of Stonehenge, the famous English circle of stones, made out of cars. Question: Whom did early farmers buy the land from? Answer: The Homestead Act of 1862 allowed homesteaders to receive 160 acres of farmland in Nebraska or other western and Midwestern states. In return, the homesteaders agreed to build homes and farm the land for at least five years. If they could survive five years of backbreaking work and uncertain harvests, the land was theirs. Watch a video about Nebraska. Declan, Tobin. " All Facts for Kids about Nebraska ." Easy Science for Kids, Apr 2019. Web. 25 Apr 2019. 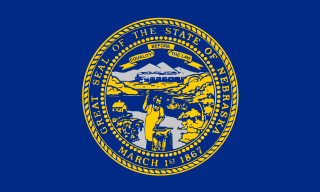 < https://easyscienceforkids.com/nebraska/ >.